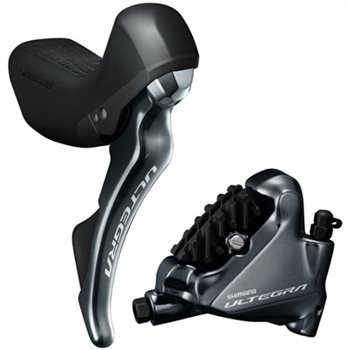 Precision-engineered Ultegra STI levers with hydraulic disc brakes give you control, modulation and power with minimal effort in all riding conditions. Shift cables are routed under the bar tape: re-development and positioning of the internal mechanism in combination with Polymer coated cables have made this possible, providing faster, lighter and smoother shifting. Vivid indexing provides a constant amount of shift lever force across all 11 sprockets. Ergonomic shift arc follows natural hand movement with inward shift stroke distance reduced for rapid and precise gear changes. Hydraulic brake lever provides excellent stopping power with less effort especially from the hood position. Hydraulic reservoir tank provides pad to rotor clearance auto-adjust maintaining braking performance during pad wear. Free stroke adjustment for pad to rotor contact setting. Tuneable reach adjusters enable custom fitment for all hands. Kit contains bled ST-R8020 STI, BR-R8070 flat mount brake callipers with pads, hoses and mineral oil (without rotors or adapters).